Every now and then, ESPN, Fox Sports, or a major media outlet will provide statistics on the general state of personal finance for professional athletes years after their playing days are over. According to a 2009 piece in Sports Illustrated, over 60% of former NBA players are in “severe financial distress” within five years, and that figure approaches 80% for NFL players shortly after retirement. That kind of wasted potential makes me sad. I just wish that some of these guys had the right mentor, financial advisor, or whatever term you want to use, to give them guidance during their playing days so that they could create a sustainable lifestyle going forward. It makes me sad because it is so easy to live off the income when you are dealing with that kind of money—it makes me sick to think about how easy it would be to structure a permanent, long-term existence on something like $10 million without putting in a whole lot of effort. (1) Gobble up $200,000 residential properties. For $10 million, you could get your hands on fifty different properties in the clear assuming you paid cash and took on no debt (if you took on debt, you could probably build a $50 million real estate empire right off the bat, but you would be introducing an element of wipeout risk that is simply not necessary once you have that kind of money). At a 10% capitalization rate, you’d be looking at $1,000,000 in annual income, before taxation and expenses. In real estate circles, there is something known as the 50% rule which states that, when it is all said and done, about half of a rent check will actually make its way into your pocket once you adjust for taxes, maintenance, property management fees, and so on. That means that an athlete could easily turn $10 million into $500,000 in rental income from his properties that he would receive in the clear. That’s over $41,000 per month to live on. Most likely, the property values will increase modestly with time, and you’ll be able to raise rents as an inflation hedge. Why would you not want to structure your life so that you can live off $41,000 per month for the rest of your life? (2) Let us assume you are completely lazy, have no business work ethic, and want to be a complete slouch receiving income once your playing days are over. At that point, I would establish a common stock portfolio of the fifty strongest companies on the planet. Applying a loose criteria like 15+ years of dividend growth, and then chopping the money into fifty different blocks of 2% ought to create a dividend income stream that will last the rest of your life. Assuming a 3.5% initial yield, you’d be looking at $350,000 in completely passive income. Pay your 20% tax, and voila, you are left with over $23,000 in spending money each month. Considering all you have to do is stay alive to reap the benefits of this arrangement, that ain’t bad. (3) Go into business. Right now, you can get Subway franchises for $250,000 each. You could get your hands on forty friggin’ sub shops. If you outsourced the management of each location to a third party management team, you ought to be able to bring in $25,000 in profit from each location when it is all said and done without stepping foot in the store. Pow. There’s a cool million bucks coming your way each and every year, without having to lift a finger. And the thing about all three of these options is that they are completely sustainable. In fact, if you go on autopilot, you are likely to grow richer with each passing year for doing nothing. The money would flood into your account. If you were on direct deposit, you would easily structure your life in such a way that you could have tens of thousands of dollars in post-tax income coming into your bank account if you did some kind of combination of the three things listed above. That is what always bothered me about seeing professional athletes go bankrupt after raking in the millions. With minimal effort, they could have put together a “1% lifestyle” for themselves without much sacrifice. Honestly, how much do you have to really give up if you spend “only” $20,000 per month? It’s a shame, because they have to spend the rest of their time on this planet wondering how their life could have been better, but they lost it all because they throttled the goose that could have laid the golden eggs for the rest of their lives. That brings me to Ty Cobb. A star with the Detroit Tigers, Cobb was probably the best ballplayer that the game of baseball had ever seen. His broke 92 MLB records. He had a career batting average of .367. Nowadays, only one or two players in all of baseball will bat above the .367 each year. Yeah, that was Cobb’s average of a twenty-three year career. He stole home 54 times. He had over 4,000 hits and almost 2,000 RBIs. He was in the first ever MLB Hall of Fame class, receiving 222 out of a possible 226 votes. By the way, that was over a dozen more votes than Babe Ruth himself got. If it wasn’t for the fact that he was one mean son of a gun, he would probably be the most legendary baseball player of all time. Despite his personal shortcomings, Ty Cobb was one shrewd businessman. He owned farms. He owned obscene amounts of cotton. He had a huge block of General Motors stock. But while that is quite impressive, his signature investment was Coca-Cola (which comprised over 70% of his net wealth at the time of his death). During the last decade of his playing days, Cobb was effectively converting his MLB checks into Coca-Cola stock. He would take a couple hundred dollars to live on (which would be a couple grand in today’s dollars), and call his broker to acquire more and more shares of Coca-Cola stock. In the dugouts at baseball games, he would encourage his fellow Tigers (and later, Philadelphia A’s teammates) to buy Coca-Cola stock, even agreeing to cosign loans for some of his teammates so they could acquire Coca-Cola stock on margin. Whenever Cobb would get in a fight with his wife, bail his kid out of jail, or run into legal trouble for his violent outbursts, his coping mechanism was to purchase Coca-Cola stock. He would take his dividends in cash, enjoy the thrill of seeing the money before his eyes, and then send the money back to his broker to buy more Coca-Cola shares. While modern ballplayers may get their highs by engaging in lavish consumption, it is clear that a man like Ty Cobb received his thrills by purchasing giant blocks of Coca-Cola stock in ever increasing amounts over the years. And certainly, my purpose here isn’t to turn you into a Coca-Cola maniac that owns a superconcentrated portfolio of a few blue-chip stocks (although there are probably much, much worse strategies out there). If you enjoy the process of investing, you can get so much farther ahead, because the journey itself (i.e. the act of investing) becomes a source of gratification in and of itself. It is so easy to turn disposable income into sustainable cash flows. Without breaking a sweat, you should be able to turn every $1,000 in funds that come your way into $35 in passive income that ought to grow a bit each year. 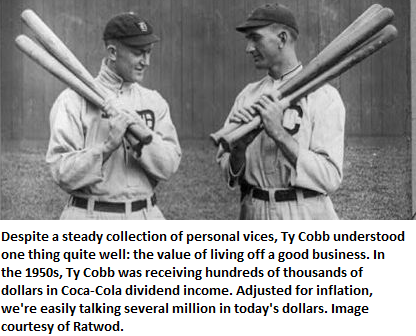 Despite his flaws, Ty Cobb understood the value of living off the income of an excellent business. It’s a shame that too many of today’s athletes don’t understand that at some level.